On Tuesday, August 28, local politicians gathered in Hokes Bluff Park to celebrate the addition of a swing. But this wasn’t just any swing – this swing is specially designed to be wheelchair accessible, allowing local special needs children to play alongside other children. Evan Shields, a nine-year-old student at John Jones Elementary, was the first to officially use the swing. Evan, who has cerebral palsy, is wheelchair-bound. Before the addition of the swing, Evan had few options for play at the park, which his family frequents with his siblings. Rodney said that there are not many places where all four of his kids can play. The new swing was added to the existing playground so that the special needs children were not isolated from other children. State Representative Craig Ford said that the swing was added for children like Shields. State Representative Becky Nordgren also shared her excitement over the new swing. Nordgren said that the project was a group effort that “everybody worked together on” without conflict. Hokes Bluff Mayor Scott Reeves thanked Ford and Nordgren for their support before detailing the steps it took to add the swing. This inspired Reeves to approach the Hokes Bluff City Council, who were supportive of the idea of adding the swing. 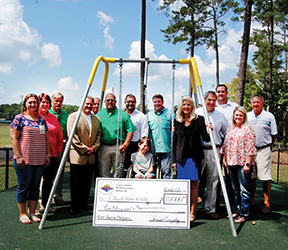 To supply the $27,000 needed for the swing, rubber safety matting and fencing, Ford and Nordgren both secured $10,000 grants from Coosa Valley Resource Conservation and Development Council to go to the project. Etowah County Commissioners Johnny Grant and Joey Statum contributed $2,500 each from their discretionary funds for the swing. After the presentation of a check from the Coosa Valley Resource Conservation and Development Council, Evan was helped into the swing, and Mayor Reeves, Ford and several others took turns pushing him.